The dictionary meaning of the word poverty is “The quality or state of being poor or indigent; want or scarcity of means of subsistence; indigence; need.” The word poverty has come from Old French poverté (Modern French pauvreté), and from Latin paupertās, from pauper ‎(“poor”). So, poverty is a state or condition in which a person or community lacks the financial resources and essentials to enjoy a minimum standard of life and well-being that's considered acceptable in society. Absolute Poverty - Absolute poverty or destitution refers to a condition where a person does not have the minimum amount of income needed to meet the minimum requirements for one or more basic living needs over an extended period of time. The basic human needs include food, safe drinking water, sanitation facilities, clothing, shelter, education and health care. Relative Poverty - Relative poverty is the condition in which people lack the minimum amount of income needed in order to maintain the average standard of living in the society in which they live. Relative poverty is considered the easiest way to measure the level of poverty in an individual country. People are said to be impoverished if they cannot keep up with standard of living as determined by society. Relative poverty is defined relative to the members of a society and, therefore, differs across countries. 14. Social factors – laws of inheritance, caste system, traditions and customs, etc. Nearly half of the world’s population — more than 3 billion people — live on less than $2.50 a day. 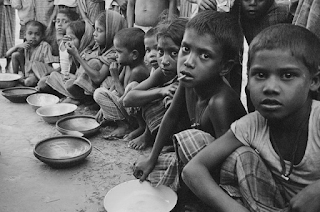 More than 1.3 billion live in extreme poverty — less than $1.25 a day. 805 million people worldwide do not have enough food to eat. Food banks are especially important in providing food for people that can’t afford it themselves. Run a food drive outside your local grocery store so people in your community have enough to eat. Oxfam estimates that it would take $60 billion annually to end extreme global poverty--that's less than 1/4 the income of the top 100 richest billionaires.